Very Good HCs, no DJ. Half bound in natural calf leather with Spanish pattern (?) marbled paper over boards, gilt overlaid veins on covers; pseudo raised bands on spine with extra gilt stamped floral and vine designs in compartments and with gilt stamped titles on red and brown spine panels; all edges marbled in Spanish pattern; end papers match cover marbling; tissue-guarded frontispiece portrait in volume 1. 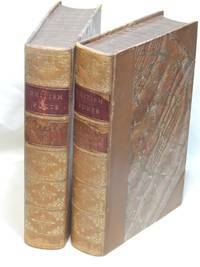 Bright, clean, square covers and spines; light edge rubbing - boards just exposed at few fore corners; some chipping from spine title panels; short scrape on volume 2 upper spine; leather remains supple; tightly bound; owner bookplate on front pastedowns; light, clean interior with some age darkening at page edges. A very handsome set. Small 8vos, 1,625 total pp (cli, 172, 394, 334, 316, 258). Very Good softcover. Clean, faintly scuffed covers; tightlt bound; bright, clean interior. 8vo, 144 pp. Good softcover. Clean, lightly scuffed covers; slightly faded on spine; tightly bound; clean interior. 8vo. Authors include: Robert Alter, Czeslaw Milosz, Erwin N. Hiebert, others. Good softcover. Lightly scuffed covers; slightly faded on spine; tightly bound; bright, clean interior. 8vo, 128 pp. Staple bound pamphlet. Clean covers; tightly bound; clean interior. Works by: Robert Speiser, Alan Feldman, Charles Stein, Eugene Schwartz, John Landon, Peter Burmeister, Wayne Guyman, Eric Felderman, Bruce Kawin, Leslie Gottesman, George J. Leonard, Gerald J. Cook, Bill Wertheim, David Shapiro, Mark Kaminsky, Aaron Fogel, David Howe. 1st US edition, uncertain printing - no adverts at rear. Good HC, no DJ. Dark brown, vertical rib-grain, cloth over boards; blind stamped quatrefoils at cover centers, enclosed in blind stamped triple fillets with corner floral sprays; gilt letters on spine; brown end papers. Clean, lightly scuffed covers; rubbed at fore corners and spine ends, light fraying; 1/8 inch strip of back strip missing at spine head; tightly bound; pencil name on front fly sheet; clean interior. 12mo, 227 pp. Includes 4 Idyls: Enid, Vivien, Elaine, Guinevere.